Makes 10-12 eight-inch fry breads. Step 1: Cook 2 cups Sichler Farms pinto beans with two strips of raw bacon. Step 2: Brown the ground beef, seasoning with salt and minced garlic. Add one pound of Sichler Farms green chile, tomato sauce, water, and bullion cube and cook for 25 minutes. Step 3: Chop lettuce, tomatoes, and onions for garnish. Set aside with grated cheese for later use. Step 4: Make fry bread - Combine flour, powdered milk, salt and baking powder. Work Crisco into dry ingredients. Add warm water. Knead well. Let dough set for 30 minutes. Form into round balls and roll 1/8 inch thick. Roll out to about 8 inches in diameter and cut small slits in dough. Fry in three inches of Crisco Shortening. Don’t allow the dough to rise. Fry until light brown. Place on top of paper towels to absorb some of the excess shortening. 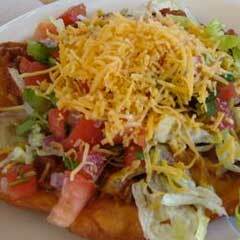 Step 5: Layer fry bread with beans, green chile/meat sauce, and top with prepared garnish.